BMO Private Bank in Barrington, invited Be@Ease to share information to staff about the importance of having an advance directive. Staff were encouraged to complete their own plans, that will provide direction of their healthcare wishes to loved ones if they are unable to speak for themselves, and share this important information with clients. Be@Ease encourages anyone over the age of 18 to have an advance directive. This is a wonderful gift we can give to our families. A special thank you to the Barrington Area Community Foundation for inviting Be@Ease to present at it’s board meeting in December, 2015. Members of the board provided their support by connecting Be@Ease with other non-profit organizations, as well as scheduling presentations for staff within their companies. Networking is so helpful in providing new opportunities for Be@Ease to share advance care planning information. Additional presentations are being scheduled. We appreciate the continued support from Barrington businesses and non-profit organizations. Thank you! 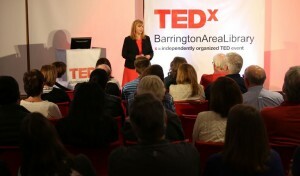 Sarah Bealles, JourneyCare’s President and CEO, was a featured speaker for the Barrington Area Library’s first-ever TEDx event on October 1, 2015. TEDx was created in the spirit of TED’s mission, “ideas worth spreading” and supports independent organizers who want to create a TED-like event in their own community. TEDx focuses on Technology, Education/Entertainment and Design to tie together local ideas on a broad range of issues. Bealles’ talk, “Living is More Than Not Being Dead,” focused on the importance of end-of-life conversations and planning. To view the video of the TEDx Talk, click HERE. Communities across the country are launching programs to educate and encourage neighbors and friends to complete advance care plans. Advance directives allow people to document what healthcare treatments they would want if they are unable to speak for themselves. In April, 10 churches in Arlington Heights, Ill., gave 11 presentations on advance care planning to more than 270 residents in the community. Using the materials developed by Be@Ease, the Arlington Heights Ministerial Association educated residents on the importance of having an advance care plan. A copy of Five Wishes – a form that can be used to document advance care plans was also given to all attendees. The events were promoted in local newspapers to encourage all residents of the community to attend. Having conversations with family and loved ones about advance care planning is gaining momentum. National Healthcare Decisions Day celebrated its ninth anniversary on April 16. The day exists to inspire, educate and empower the pubic and providers about the importance of advance care planning. The goal of the initiative is to encourage patients to express their wishes regarding healthcare and for providers and facilities to respect those wishes, whatever they may be. If you are interested in launching an advance care planning program in your community, please visit www.beatease.org. The tools and resources are available free of charge. The goal of Be@Ease is to encourage anyone 18+ to think about their wishes, put them in writing and share them with others If you would like more information on advance care planning, please contact Rachael Telleen at rtelleen@journeycare.org or (312) 912-2678. If on your way to work this morning you were injured in a terrible accident and doctors weren’t sure you would survive, would your family members know how to honor your final wishes? According to a recent survey by the California Health Foundation, 60 percent of respondents said it was extremely important that their family not be burdened in making tough decisions about their care. However, 56 percent of respondents had not discussed their wishes. Arlington Heights Ministerial Association has joined the Be@Ease campaign to help residents learn to talk about advance care plans so that if an emergency situation ever does arise, families are prepared. Besides getting the conversation started, the Be@Ease campaign also provides access to Five Wishes©, a nationally recognized document that allows anyone 18 and older to share their wishes about the end of life. Once completed, the Five Wishes document is valid under the laws of 42 states, including Illinois. The Arlington Heights Ministerial Association, whose leaders often are called to guide a family through times of crisis, will be hosting 11 free seminars during Five Wishes Week, April 11-18 and April 25, to provide convenient opportunities and locations for residents to engage in conversation. www.churchonthepark.com 10 a.m. 7 p.m. The Healthier Barrington Coalition is conducting the 2014 Healthier Barrington Needs Survey. This survey has been conducted by the Coalition every three years since 1996 and offers residents living in the 60010 area an opportunity to provide input into the various aspects of living in the Barrington area. Topics include transportation, recreation, education, healthcare, employment and much more. This year they have added questions related to whether people have advance directives and if they have heard about or used Be@Ease resources. The survey takes about 10-15 minutes to complete and can be accessed online at: www.TakeTheCommunitySurvey.com. If you are a resident of Barrington, please add your voice to the conversation – take the survey today! The Barrington Area Library has added additional resources on the topics of planning for the end-of-life and preparing advance directives. Please take a moment and review the offerings under the Resources heading of the Be@Ease website.